It’s now officially 2018…which also means that PyImageSearch is (almost) four years old! I published the very first blog post on Monday, January 12th 2014. Since then over 230 posts have been published, along with two books and a full-fledged course. At the beginning of every New Year I take some quiet time to reflect. What went well and gave me life? What went poorly and sucked life from me? How can I double-down on the positive, life-giving aspects? How can I get the negative aspects off my plate (or at least minimize their impact on my life)? These four questions (and my thoughts on them) ultimately shape the upcoming year. But most of all, the past four years running PyImageSearch has always been at the top of my list for “life-giving”. Thank you for making PyImageSearch possible. Running this blog is truly the best part of my day. Without you PyImageSearch would not be possible. Hi Adrian, I’ve been reading PyImageSearch for the past couple of years. One topic I’m curious about is taking screenshots with OpenCV. Is this possible? I’d like to build an app that can automatically control the user’s screen and it requires screenshots. But I’m not sure how to go about it. Shelby’s question is a great one. Building a computer vision system to automatically control or analyze what is on a user’s screen is a great project. Once we have the screenshot we can identify elements on a screen using template matching, keypoint matching, or local invariant descriptors. The problem is actually obtaining the screenshot in the first place. applying the computer vision or machine learning itself. To learn how to take screenshots with OpenCV and Python, just keep reading. Today’s blog post is broken down into two sections. In the first section, we’ll learn how to install the PyAutoGUI library. This library is responsible for actually capturing our screenshots to disk or directly to memory. From there we’ll learn how to use PyAutoGUI and OpenCV together to obtain our screenshots. You can find instructions for installing PyAutoGUI in their install documentation; however, as a matter of completeness, I have included the instructions below. I highly recommend that you install the PyAutoGUI into your Python virtual environment for computer vision (as we have done for all other install tutorials here on PyImageSearch). Discussing virtual environments in detail is beyond the scope of this blog post; however, I encourage you to set up an environment for computer vision (including OpenCV and other tools) by following the installation instructions for your system available here. Now that PyAutoGUI is installed, let’s take our first screenshot with OpenCV and Python. On Lines 2-5 we’re importing our required packages, notably pyautogui . From there we’ll take a screenshot via two different methods. Line 10 shows that we’re grabbing a screenshot with pyautogui.screenshot and storing it as image (again, this image is stored in memory it is not saved to disk). PyAutoGUI actually stores the image as a PIL/Pillow image, so we need to perform an additional step before the image can be used with OpenCV. On Line 11 we convert the image to a NumPy array and swap the color channels from RGB ordering (what PIL/Pillow uses) to BGR (what OpenCV expects). That’s all that’s required for making our screenshot image OpenCV-compatible. From here the sky is the limit with what you can do. You could detect buttons displayed on the screen or even determine the coordinates of where the mouse is on the screen. We won’t do either of those tasks today. Instead, let’s just write the image to disk with cv2.imwrite to ensure the process worked correctly (Line 12). As shown, this one-liner writes the image straight to disk. Enough said. Here, we read the image from disk. Then we resize and display it on the screen until a key is pressed. As you can tell, PyAutoGui is dead simple thanks to the hard work of Al Sweigart. Figure 1: Taking a screenshot with Python, OpenCV, and PyAutoGUI on macOS. Notice how in the terminal the Python script is running (implying that the screenshot is currently being taken). After the script exits, I have two new files in my working directory: in_memory_to_disk.png and straight_to_disk.png . drwxr-xr-x@ 5 adrian staff 160 Jan 01 10:04 .
drwxr-xr-x@ 8 adrian staff 256 Jan 01 20:38 ..
Now that we have our screenshot in OpenCV format, we can apply any “standard” computer vision or image processing operation that we wish, including edge detection, template matching, keypoint matching, object detection, etc. In a future blog post, I’ll be demonstrating how to detect elements on a screen followed by controlling the entire GUI from the PyAutoGUI library based on what our computer vision algorithms detect. Stay tuned for this post in early 2018! In today’s blog post we learned how to take screenshots using OpenCV, Python, and the PyAutoGUI library. Using PyAutoGUI we can easily capture screenshots directly to disk or to memory, which we can then convert to OpenCV/NumPy format. Screenshots are an important first step when creating computer vision software that can automatically control GUI operations on the screen, including automatically moving the mouse, clicking the mouse, and registering keyboard events. In future blog posts, we’ll learn how we can automatically control our entire computer via computer vision and the PyAutoGUI. To be notified when future blog posts are published here on PyImageSearch, just enter your email address in the form below! hello sir I really can’t explain how good your blogs are and i need your help.I have working on a project to make snapchat like filters.I have used DLIB to get the facial features.I am unable to draw the filter at specific coordinates. I have seen your post on drawing overlays but i am unable to do the same with a png image. scrot can also dump a screen shot as a png file which you can read onto opencv. Agreed that pyautogui is elegant. Thanks. Thank you for the kind words, Suhas 🙂 Comments like these really make my day. A Happy New Year to you too. I have no question today but just to wish you and the crew at pyimagesearch every best in 2018 and continue with your great evangelism of computer vision/OpenCV/ML/AI agenda. I look forward to every Monday to read your blog posts. Thank you Abkul, I really appreciate that 🙂 Have a wonderful 2018 as well. Thank you, sir. This post was really helpful. Thanks Ricardo — I’m glad you found it helpful! well done. i have a question. what if i want to take the screenshot of the active window. I don’t think OpenCV and Python directly allow this. 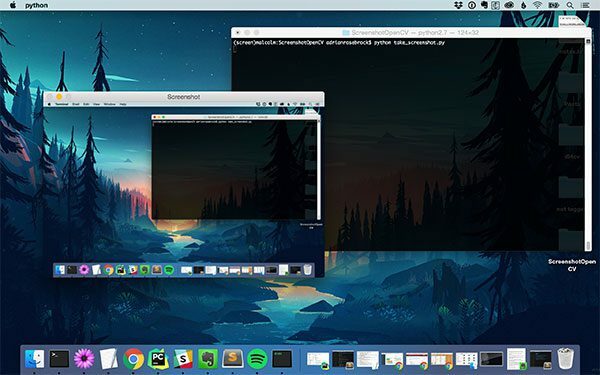 You could first capture a screenshot and then use OpenCV’s GUI functions to determine the location of the window and then crop it from the output image. Would this work to capture a picture that my raspberry pi is projecting onto a web interface?? Hey Brendan, I’m not sure I follow. Could you share a screenshot or illustration of what you are trying to accomplish? But where is the next post ? Thanks Gauthier, I’m glad you liked the post. To be honest I haven’t had a chance to write the next post yet. I’ve been busy writing some new deep learning tutorials and simply haven’t had a chance to get to it yet. So you can directly construct opencv image. Below example does it for PIL. since original code had inverse Red and Blue channels. Thanks for sharing! I am just a beginner in programming stuff. I have a video of a traffic junction and i need to capture screenshot from this video at the press of a key (basically when any vehicle goes towards parking). These images are then stored in a specified location for further processing. Do you have any related tutorials for this? Hey Susan — all you would need is the “cv2.imwrite” function to write frames to disk. If you are new to Python and OpenCV I would recommend that you work through Practical Python and OpenCV to learn the fundamentals. The contents of the book would help you solve the project very quickly, I am absolutely confident of that. Hi. I am trying to create a free accessibility stand alone python program to convert scanned pdf’s that screen readers do not read. I am self a blind man and the online converters is not a option for I need to convert company documents. Also friends and family members I know is blind and am looking for this. My problem is I did the pdf convertion to jpg with wand and image magick but when I made a .exe with pyinstaller it did not work for the machine the .exe runs on do not have imagemagick installed. Also I can not install it on the work computer. So searched and saw the options to convert scanned pdf to images all have third party libraries that will not bundle with the .exe file. So decided a screenshot is a image. So how can I load a scanned pdf, take screenshot of the pdf and then save it to disc to process. I only want to take a screen shot of the pdf page itself. Thank you and enjoyed your deskew solution that assisted me a lot. Hi Hendrik, this is a wonderful application you are taking on. I hope it is successful. I actually wrote a tutorial dedicated to taking screenshots with OpenCV. Take a look and see if that helps resolve the issue. Is there a way where we could apply this to a video and trigger it using an external source? dependency is numpy and ofcourse X11 (which is available on most linux system anyway). This is really cool, thank you for sharing Mher!